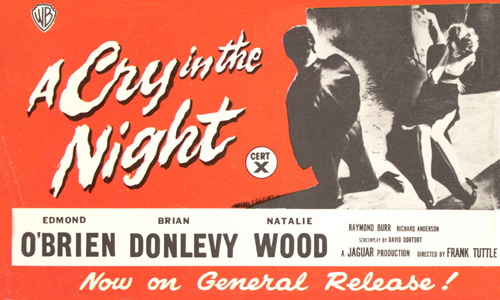 A CRY IN THE NIGHT (1956) is a watchable crime drama recently released by the Warner Archive. Classic film fans will sit up and take notice from the first scene, as the movie begins with narration from the distinctive voice of Alan Ladd. Ladd's Jaguar Productions was the company behind the film. 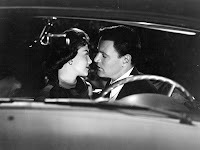 Elizabeth "Liz" Taggart (Natalie Wood) and her secret fiance Owen (Richard Anderson) are parked at a lover's lane, enjoying time together and discussing plans for Owen to meet Liz's uptight father (Edmond O'Brien), a cop. 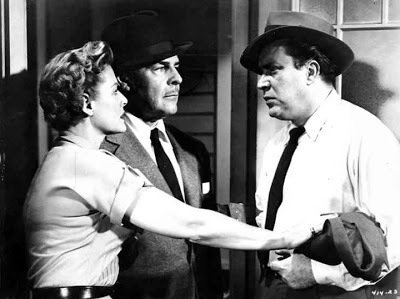 Unfortunately, Liz and Owen picked the wrong place to park; they're attacked by a disturbed man, Harold (Raymond Burr), who knocks out Owen and kidnaps Liz. 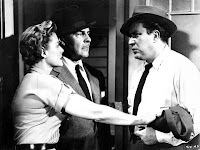 Liz's distraught father initially seems to blame Owen as much as the actual criminal, but fortunately Captain Ed Bates (Brian Donlevy) is calmer. It's a confounding case, however, until they get a lucky break when the desk sergeant (Herb Vigran) recognizes something a little unusual about a "missing persons" call. I first saw this film in 2013, and I liked it, while recognizing it had some issues. I had a similar reaction revisiting it today. On the plus side, it's a fast-paced film, clocking in at 75 minutes, and it's fairly engrossing, with a good cast. That said, the film could have been a bit stronger. 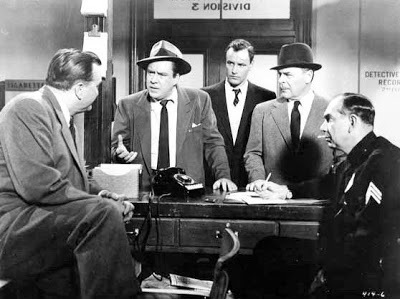 I love Edmond O'Brien -- see last year's centennial tribute -- but his character is unpleasant and played at fever pitch all the way through. O'Brien was unable to bring his usual likeability to the role; he seemed to miss the chance to convey more positive things about his concerned dad between the lines and instead comes off as mean. It's initially hard to understand why Liz is reticent to bring the clean-cut, marriage-minded Owen home to Dad -- until her difficult Pop enters the picture. I did find O'Brien's character easier to take the second time around, because I knew going in what to expect. And fortunately he's balanced by Donlevy and Anderson, who are both very appealing in their roles as detective and boyfriend. There's also a small but sympathetic role for Peter Hansen as the doctor who recognizes Owen isn't "drunk and disorderly" -- there's a reason he smells like booze -- but has been seriously injured. Wood, who in real life was on the cusp of adulthood off the screen, looks older than her true age at the time of filming (17), and she handles an emotional role with skill belying her years. Of course, she may have been young but she had many years of screen experience already behind her! This is another in Burr's catalogue of extremely creepy characters. He's always good, if scary! The supporting cast includes Herb Vigran, Anthony Caruso, Irene Hervey, Mary Lawrence, and George J. Lewis. 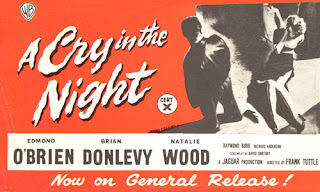 A CRY IN THE NIGHT was directed by Frank Tuttle, with black and white cinematography by John F. Seitz. The Warner Archive DVD is a great-looking widescreen print. There are no extras. 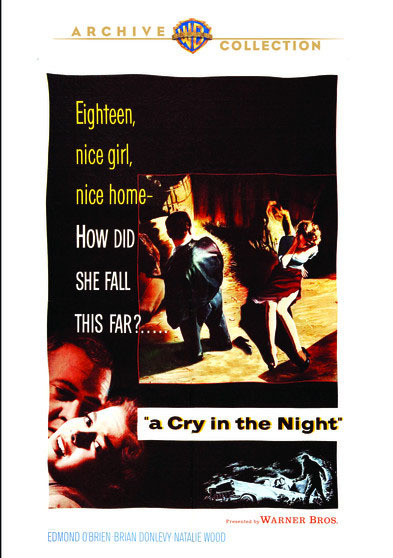 As a side note, the wording on the original poster used on the DVD case is truly strange: "Eighteen, nice girl, nice home - How did she fall this far?" That's right, being kidnapped is all her fault! 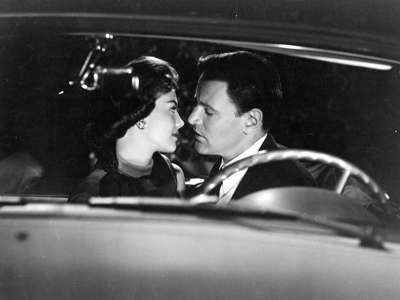 For more on this film, KC has written a thoughtful review at A Classic Movie Blog. Thanks again for the link. Looks like we are in agreement about the the pros and cons of this film. It didn't really have my attention until Wood and Burr began to interact. I actually missed Ladd's voice at the beginning! Of course, I've never been very good at identifying celebrity voices. I first saw this as a kid watching the late, late show. Boy, did it give me the shivers! I'm not always that good at picking out voices myself, KC, but Ladd's is really distinictive for me. Glad you enjoyed the review, Jenn. Caftan Woman, I can imagine that it would be a "shivery" experience watching as a kid late at night!